Horse is sturdy and real cute. Solid wood rockers. The personalized bandana makes this special. Nice soft material. Beautiful colors. Easy to assemble. The song, sounds, mouth moving, tail swishing are so sweet. Will definitely be enjoyed. 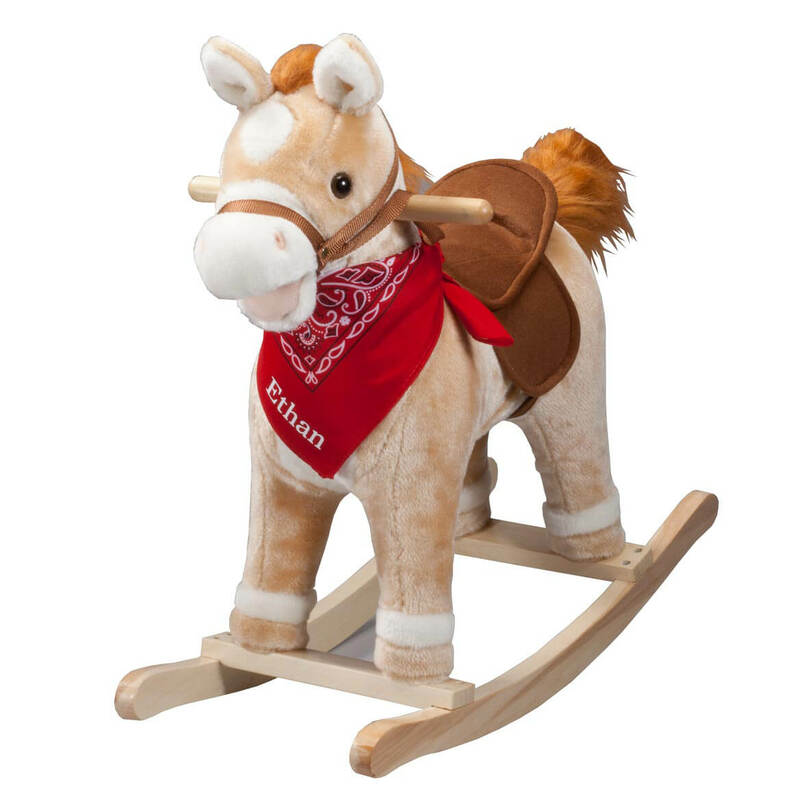 Really like the quality of this rocking horse, has the look I remember as a kid. Sound is great and adds a nice fun touch. Like the idea that the bandana has the name on it so as my nephew grows up it can be passed to new family members. I bought it for my grandson that's on his way it was a hit at my daughters baby shower!! We would definitely recommend this product. The rocking horse is plush & soft. It was easy to assemble. Pleased with the quality. The sound is awesome!! The mechanical features, the tail swaying & the mouth moving are adorable. It's so cute that I am hitting the ears all the time and my wife and I just laugh. The only bad thing is the tail won't move it just makes a grinding noise. Will be sending it back for a replacement. My niece loves her "horsey" It's so cute! a little loud and smaller than I had expected but such a fun and cute horse for my niece who loves animals. Cute but WAY TOO LOUD!!! If you are interested in this product, please do not purchase it for young children!!! Bought for granddaughter (not quite 2 yrs old)... Thought the horse was cuter than others to be found at the same price point... Took it out of the box, again everything looked great ... My husband and I pressed the button and ... BOOM! The sound was like back-stage at a KISS concert. I mean, folks, this horse is LOUD!!! There is no way I can give this product to my grandchild. It will frighten her to the point of tears. Her mommy and daddy just moved to a farm and my granddaughter loves to look at the "horsies"... I am afraid this product might scare her away from ever enjoying a real horse ride. Just reminds me of being a Kid and the love for horses. Knowing it has my name on it would have been a dream, so I have purchased for my Grandson who just turned two, so he can always remember Grandma gave it to him. My granddaughter calls horses neigh neigh and the pony is just beautiful! I liked that I could personalize the bandana with her words for horse. My nephew loves horses and this is perfect! Ideal for a little boy!! Love the personalized bandana!! My 3yr. old granddaughter loved this. Seems sturdy. Priced right. My grand daughter loves horses and this will be perfect for her she will love it. It's perfect size and I looked at so many. For my grandsons age and personalization it's amazing! It's for my first great grandchild, a great grandson. Because it's anImated personalized and the promotion! Thanks! I wanted something really special for grand-baby's 1st birthday and this is it. My Granddaughter love love loved this horse! What is the age range and weight limit on this? BEST ANSWER: Thank you for your question. This item is not recommended for children under 3. We suggest children 4-6 use this item, under 60 pounds. We hope this information will be of help to you. 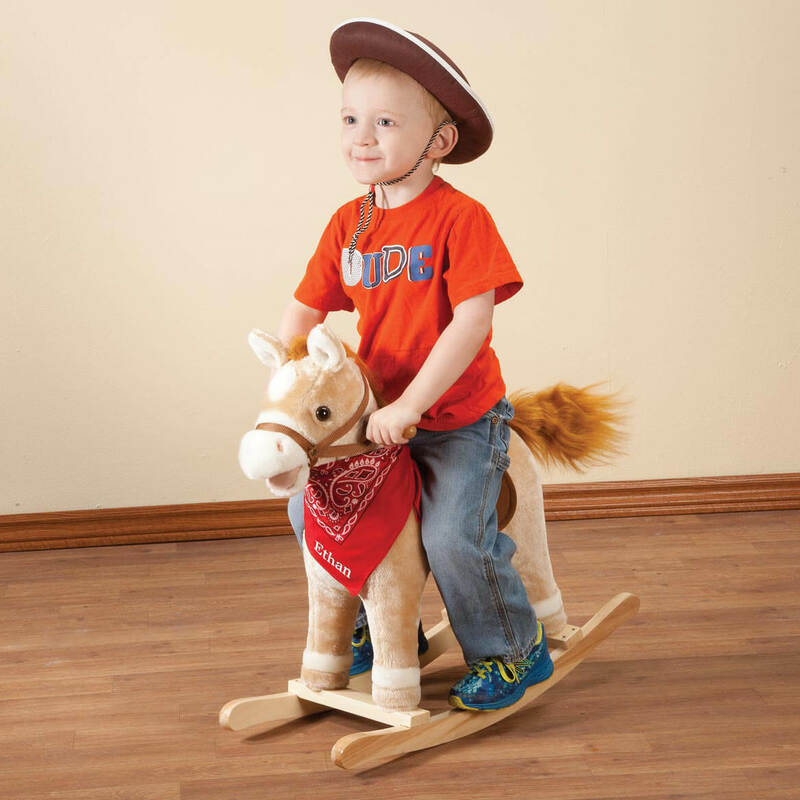 Personalized Animated Rocking Horse with Sound 357674 when will this picture be available? BEST ANSWER: Thank you for your question. After 9/23/2016. We hope this information will be of help to you. How old is the boy on the horse ? The boy looks to be 3 or 4 years old. What songs does it sing? BEST ANSWER: Thank you for your question. There is just a tone not a song. We hope this information will be of help to you. What’s the age range and the weight limit? BEST ANSWER: Thank you for your question. It is for ages of about 3 and up. Max weight is about 40 lbs. We hope this information will be of help to you. Maximum weight of child that can ride this horse? BEST ANSWER: Thank you for your question. The age limit is 3 years old so the weight limit would be around 40 pounds. We hope this information will be of help to you. What are the lyrics to the song that the horse sings? BEST ANSWER: Thank you for your question. The horse only plays one song and it Ride Em Cowboy. We hope this information will be of help to you. Can you turn the volume down? BEST ANSWER: No. We bought this for our grandson for Christmas. He loves it!! The volume is what it is, and little kids love things that make fun sounds. It was a huge hit with our little guy. Is this for a one year old? BEST ANSWER: Thank you for your question. This is not for children under 3 years of age. We hope this information will be of help to you. Are the ears and tail animated? BEST ANSWER: Thank you for your question. The mouth and tail move. We hope this information will be of help to you.